Want big city style when you’re shopping in Rochester’s southern suburbs? 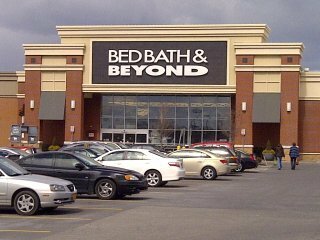 Get the style you want and shop all the brands you love at the Bed Bath & Beyond® store near you in Henrietta; easily accessible from I-390, you’ll find it in the Market Square Plaza on W Jefferson Rd. When you need kitchenware, dorm bedding, stylish storage solutions and modern home décor ideas, get inspired and get everything you need for your home at this Bed Bath & Beyond® store located at 720 Jefferson Road, Henrietta, NY 14623; (585) 424-6310. Going to Rochester Institute of Technology? Use the college checklist to get twin XL sheets, tailgating supplies (go Tigers!) and dorm essentials; friendly and knowledgeable associates are ready to assist you with your selections during store hours. Getting married? Let our experienced personal wedding consultants help you create the perfect wedding registry while you select your china pattern. Need gifts? You’ll find a nice selection here; use the gift registry feature to create or shop a baby registry, birthday registry, anniversary registry or custom occasion registry.